Hi everyone. I've been updating sections of the blog lately: the width of the posts column should now be wider to make for easier reading, and there is some new content under the "Living History and Museums" and "War of 1812 Board Game" tabs of the website. In the "Living History and Museums" page, I'm hoping to create a catalog of the places I've visited, near and far, with a link to relevant posts on this blog as well as basic info (links to more info, basic admission prices, special events etc.). Currently there are two entries, with links to the official sites and admission prices. In the "Board Game" page I've posted the complete rules for the 1812 war game I've made up based on Avalon Hill's Battlecry! By converting the rules for minis and ruler-style gameplay, all you really need for the game is a set of poker chips, a ruler, and 4-8 six-sided die. As for what I've been up to lately, I've been busy helping to write content for the new Fort Meigs website, which should launch soon. I've also been on vacation this week. For me, a vacation means the serious business of learning about another region's history, ecology, and culture. The Low Country of South Carolina is no exception. Hilton Head Island: Our base of operations. Traditionally a refuge for runaway slaves and a dwelling place of prehistoric Indian cultures, the island was used as a major encampment and hospital by the Union during the American Civil War. Nowadays it is mostly covered and subdivided by private resorts, golf courses and shopping malls. Savannah, Georgia: A city built on cotton, or rather founded on rice plantations and thriving on the cotton trade, even after the Civil War. It's stately squares are lined with old and elegant houses. The waterfront, which is down a 60 foot embankment from the level of the town, is lined with old warehouses. The whole waterfront has been made over into tourist traps (with the exception of one excellent hat shop), and is every bit as tacky and crowded as the Atlantic City boardwalk or Gatlinburg, Tennessee. Nevertheless the maritime heart of the seaport still beats as massive container ships cruise past the quay. 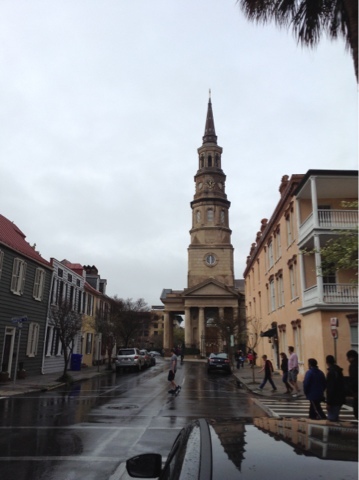 Charleston, South Carolina: bastion of the old South, or Antebellum theme park? This question lingered in the back of my mind as I wandered the streets of this old town. I visited a lot of different sites within these areas, so I'll have to make several blog posts to cover the ground. 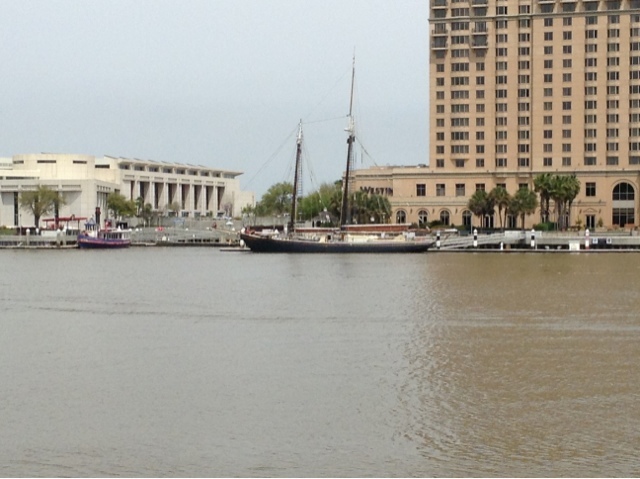 The Savannah River opposite the River Walk area. 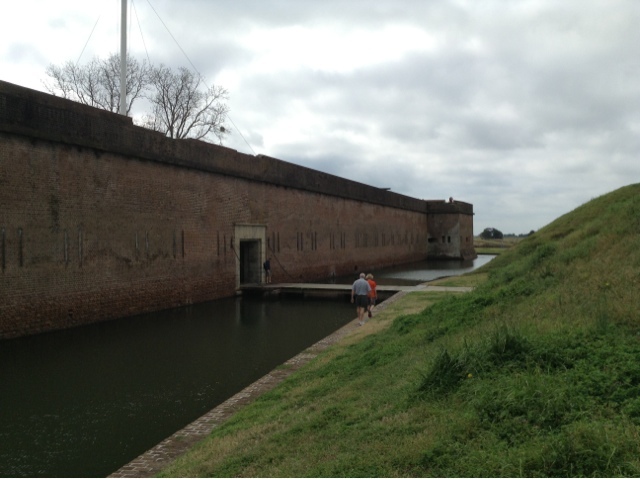 Fort Polaski, on Cockspur Island outside of Savannah. Sir, don't you ever take a real break and just do nothing at all? I mean, doesn't it get to a point where you just want to veg on the couch and pop a beer? I do that too, but when traveling I like to exercise my mind. I generally cannot spend more than a full day or so sitting on a beach without something else to engage my attentions.